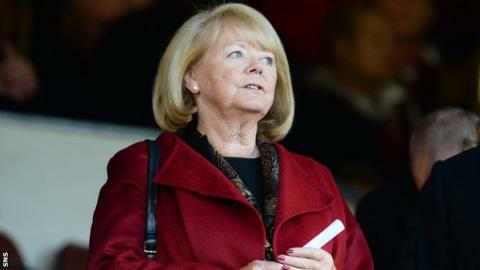 Hearts owner Ann Budge has criticised the behaviour of both sets of fans at Sunday's Scottish Cup tie but aimed most of her wrath at Celtic's support. Budge was "appalled" at vandalism she says "caused the destruction of close to 100 seats" at Tynecastle, plus "disgraceful" acts of graffiti. She also complained of "intimidation" of Hearts fans and staff, with some young fans being "traumatised". Celtic also published a list of concerns arising from the match. Those included a home supporter attempting to enter the field of play. Budge said that the police report confirmed one home fan was arrested for sectarian abuse, while five away fans were arrested for sectarian abuse, coin throwing and disorderly behaviour. However, a Celtic spokesman told BBC Scotland that none of the five arrested were charged with sectarian offences. And a statement from the Scottish champions said: "We share the concerns expressed by Ann Budge and her aim to eradicate all forms of offensive behaviour from Scottish football." Celtic striker Anthony Stokes: "Maybe Ann budge should worry about her own fans,never had so many sectarian comments directed at me in a ground like tynecastle the othr day"BBC Scotland's Tom English: "Excellent statement from Ann Budge. Strong leadership. Everybody should applaud her." Celtic won the fourth-round tie 4-0, with the Championship leaders' chances having been hampered by an early red card shown for Morgaro Gomis. "The match was a disappointing football spectacle for both sets of supporters," Budge told the club website. "It does not justify bad behaviour - on or off the field. "I was appalled at the vandalism carried out by our visiting supporters on Sunday. "Having recently spent significant sums to replace broken seats in the Roseburn Stand, for the benefit, primarily, of our away supporters, I was hugely disappointed to witness the destruction of close to 100 seats. "Similarly, the graffiti on walls, tiles, doors - basically all types of surfaces - was quite disgraceful and this is not to mention the damage to toilets. "I have received a number of emails/letters from parents stating that their children were terrified/had to be removed part way through the game/were traumatised - and as such would be unlikely ever to want to return to a game. This is appalling." Budge has spoken to Celtic about the incidents and plans to raise concerns with the police. "Everyone gets frustrated when officials and police appear to take little or no action," she said. "This is something I will discuss with the authorities, but as many of us know, their response is very often influenced by a need not to further inflame a situation. "The only real answer is to try to remove those people who cause the problems and who spoil the whole experience for so many others." Celtic's statement referenced an attack on former manager Neil Lennon at Tynecastle in 2011 and "continued sectarian abuse directed at Celtic management, staff and players". The Scottish champions added that a "Celtic supporter sustained injuries at the match after being hit with coins... We are also aware of a home supporter again attempting to enter the field of play at Tynecastle, this time to approach one of our players. "We are addressing these matters with Heart of Midlothian and welcome the desire of Ann Budge to seek a positive and enjoyable matchday experience for all football supporters at Tynecastle." Budge admitted that only "a tiny proportion of the 12,000-plus crowd" had been involved but promised a zero tolerance approach to those causing problems. "This includes taking action against our own supporters who let the side down; vigorously pressing other clubs to be accountable for the actions of their supporters and, where necessary, petitioning the authorities to take appropriate action," she said. Budge said that the Hearts supporter arrested for sectarian abuse would "not be allowed back into the stadium".